Danze is a manufacturer with a really modern attitude to the way they do business, and they pride themselves on the fact they listen to what their customers have to say. 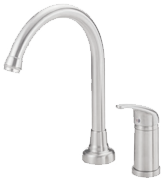 That said, in the reviews below you will find a kitchen faucet that offers commercial features without the commercial price tag. Unlike many of the “big boys” the overall impression you get with this manufacturer is that they are still somewhat humbled by the fact that people all over America are enjoying the fruits of their labors. If you decide to opt for a faucet below, you’ll not only be pleased with the quality of the product, you can also be rest assured you are a customer and not a number.